Did you know that Sweet Potatoes are one of the top anti-inflammatory foods you can eat? That’s not all; they are loaded with vitamins such as B6, C, D, iron and magnesium. Don’t let the sweet taste fool you. These dessert-tasting potatoes are even good for diabetics. Sweet potatoes have a low glycemic index meaning your body absorbs the sugar at a slower pace. If that doesn’t convince you to ditch white potatoes, you may make the switch as soon as you taste this delicious Sweet Potato Carrot Mash!The Fall season inspired me to create this beautiful medley of sweet potatoes, carrots, onions and garlic. The color is vibrant and the taste will satisfy your hunger for warm comfort food as the weather cools down. Better yet, this recipe will compliment your roasted chicken and meat dishes and will make a perfect addition to your upcoming Thanksgiving spreads. The best part of this recipe is how easy it is to make! Just boil all ingredients, drain and mash. You’re going to need a hand blender for a smooth consistency. You can also transfer to a food processor or blender. If you want to make the process even quicker you can skip the step where you warm the milk and butter. Instead just add the ingredients in and blend. This is no ordinary mash! 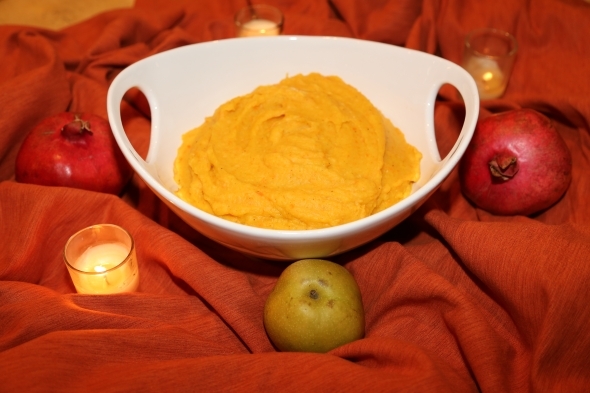 Sweet potatoes and carrots compliment each other for a bright colored medley. Place sweet potatoes, carrots, onions and garlic in a large pot and cover with water. Partially cover, bring to a boil adding a dash of salt. Cook until very tender, about 30-40 minutes. Drain well. Melt butter in a small saucepan over medium-high heat. Add milk, stir and bring to a low simmer. Add milk mixture to potato mixture and blend with a hand blender until smooth. Add salt and pepper and serve.